Scatterbrained horsemanship like mine has a way of leaving holes in training. That’s ok, I tell myself. 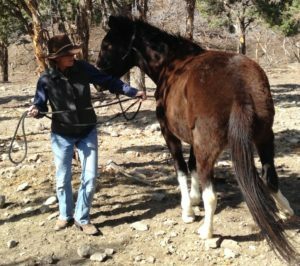 Exposed holes get filled and the return to fundamentals makes for an improved horse, an improved rider, and, most importantly, an improved relationship. Read about filling Holes in Training. Jolene, a nervous gal, doing what she liked to do in the early days. A friend reaches out to pat her. To snub is to check the movement of a horse by wrapping the lead line around a post or a tree. 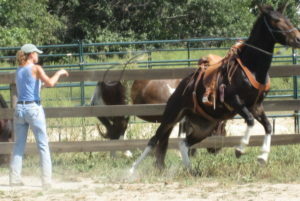 A nervous horse who pulls back when its line is around a post will still be able to move, but she won’t get away. 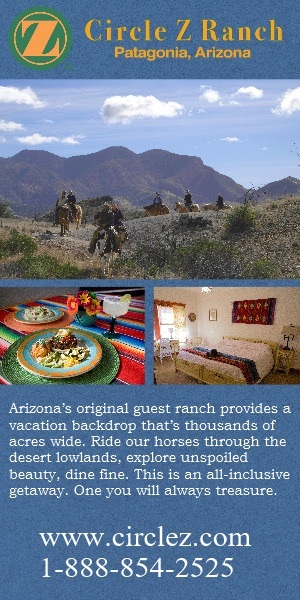 It’s a preferable alternative to tying a horse fast and hard or having the horse get loose. Now, I had a new plan. 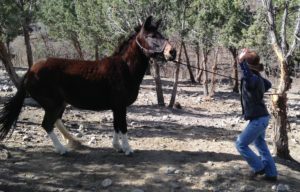 After bringing her from the pasture, I find a decent space with a tree and move her with vigor and animation. At first, she tries to bolt, especially when I’m in her right eye. Each time, I act nutty until she pauses. At that moment, I stop. I switch sides and repeat. Jolene is learning that she can move her feet without leaving me and that I won’t restrict her. After she’s relaxed with this snubbing exercise, I transition to moving her animatedly without the tree to help me. (see photo at right) She’s finding staying power in a sensible manner. Rick Gore has a great page dedicated to hobbles and hobble training. Click here. I introduced Jolene gently, with soft, cotton hobbles (not leather or nylon). Maybe it was too gentle. With her narrow stance and these lengthy hobbles (see right), she was able to step almost normally. Nonetheless, she learned there was no need to panic with something restrictive around her legs. When I approached her with hands up, she moved her haunches over once, then stood still. 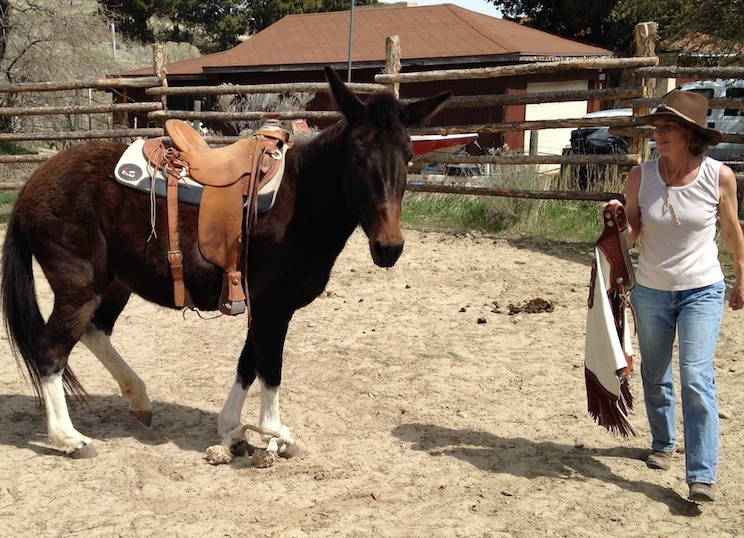 Read Amy Skinner’s checklist for first rides. Read about progress in strange places. Read about filling Holes in Training. 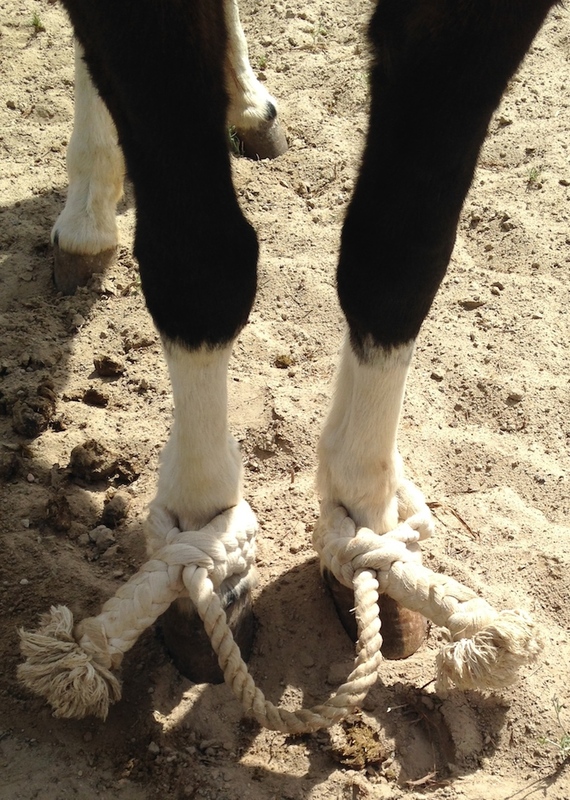 Posted in BestHorsePractices, Equine Safety, Horsemen & Women, Mule and tagged groundwork, hobbling a horse, snubbing a horse.